The FBI interviewed 182 people who reported seeing a rising streak of light in the sky moments before TWA Flight 800 exploded into a ball of flames off the coast of Long Island, NY in July of 1996. Most of these witnesses said the streak exploded at its apex, right where the jetliner was traveling. Federal investigators said the rising streak was the plane itself climbing sharply after exploding, but the law of conservation of energy doesn’t allow for such a climb because the FAA radar sites that tracked the jet did not record a necessary and simultaneous reduction in airspeed. According to this physical law, jetliners climbing in a gravitational field must either be propelled by adequate thrust or slow down. A 747 does not have enough thrust to maintain airspeed while climbing the 12,000 feet per minute indicated in government animations. The only way Flight 800 could have climbed that steeply at that time would have been if it had tapped into its “kinetic energy” (proportional to its velocity squared) and slowed down. So we know the jetliner didn’t climb, thanks to hard data from radar sites. But hard data like this was only footnoted by National Transportation Safety Board Chairman Jim Hall who acknowledged that data may prove the aircraft didn’t climb, but did not object to an animation of the evidence-defying climb shown at the final Board meeting on the crash. And a Safety Board doctor of Psychology (not of Physics or Aerodynamics) announced that the steeply rising streak seen by so many “may have been the accident airplane in crippled flight.” Chairman Hall gave this psychologist the final word regarding the complicated aerodynamic principles at play after a 747 breaks in two at 13,800 feet. 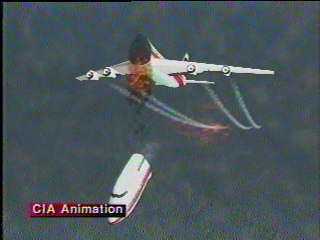 Still frame taken from the CIA animation of TWA Flight 800, released on November 18th, 1997. However, the FAA radar sites mentioned above recorded the aircraft maintaining its airspeed when the CIA said it was climbing sharply–two mutually exclusive phenomena. In theory, Flight 800 could have climbed sharply. Stunt pilots regularly perform such climbs by exchanging airspeed for altitude. A stunt plane’s kinetic energy (one half the mass of the aircraft times the square of its velocity) is converted into potential energy (the gain in altitude times the mass of the aircraft times gravity). The steeper the climb, the more energy converted, causing a greater reduction in airspeed. Since Flight 800 did not slow down, there wasn’t enough energy available to ascend sharply. It is the law of conservation of energy that excludes the climb by requiring that any proposed gain in potential energy be accounted for. And since the maximum thrust of Flight 800’s engines could not maintain even half of the climb rate shown in government animations, the required energy was missing. Why Didn’t Flight 800 Climb? Flight 800 did not ascend because it was turning north when it broke in two. FAA radar sites recorded the turn (see the “Primary returns” below), causing the NTSB’s Dennis Crider to conclude in the ‘Main Wreckage Flight Path Study’ that the aircraft “turned north of the pre-event course line“. TWA Flight 800’s ENE crash trajectory taken from the NTSB Main Wreckage Flight Path Study. Note the northward turn of the main wreckage as indicated by the primary radar returns shown as hollow diamonds and located more than 1/4 mile north of the pre-event course line. The solid and dashed straight lines represent simulations consistent with the CIA animation and inconsistent with the radar evidence. While steeply banking left (which radar tracking indicates and some of the closest eyewitnesses reported seeing), the lift from the aircraft’s wings would have propelled the aircraft northward. The loss of the forward section of the aircraft therefore would not have resulted in the government’s proposed climb; rather Flight 800 would have continued its northward turn and descended to the ocean on a trajectory matching the radar evidence and obeying physical laws. Conversely, the officially-proposed flight path doesn’t match the radar data and breaks a fundamental law of physics. This means the official crash sequence cannot physically account for the fast-moving streak of light that many eyewitnesses interviewed by the FBI said rose nearly vertically moments before Flight 800 fell from the sky in flames. This entry was posted in TWA Flight 800 by stalcupt. Bookmark the permalink.